Best Online Employee Timesheet software for simplicity. Online Timesheet for Employees facilitates business internal use as well as outside sub-contractors. Free Online Employee Timesheet Software and Easy Time Tracking Software for small businesses ready for use today. With Online Employee Timesheet Software employee can fill details daily, all the time entries are persisted and recorded for the future processing, either on a week or month basis. Employee Timesheet Software provides the full benefit of daily Timesheet and daily Data Timesheet Entry for small businesses. Online Easy Employee Timesheet Online & Payroll Reports – Get Everything In Real-Time! Business Integration Software Ltd employee timesheet software makes the process of clock-in and clock-out for your staffs more effortless and your timesheets and payroll management. No more use of papers, no more headaches for messy spreadsheets, and no more manual timesheet calculations – just a few clicks and you will have complete details on your online employee timesheet software and payroll at your disposal. Print your data or export it anytime – our Online Easy Timesheet Software ensures you ease of use and real-time results! Seamless and efficient time tracking is all we specialize in! We’re continually upgrading our services, our forte, and our software systems so that you can stay ahead. Our Powerful reporting and employee timesheet management software are suitable for every small, medium, and large enterprise. Employee Timesheet Software is available all the time online which makes the companies around the world keep up to date with the latest project, resources and timesheet reports. What Our Employee Timesheet Software Can do you and your staff? Employee Time Tracking and Time Keeping entries are user-friendly. It has built-in time entries validation to ensure tracking is done at the initial stage of the submission. All-time entered is validated against the employee configurable working hours for full-time staff or contingent workers. Employee Time Tracking Software validates against it and rejects automatically if the time recording criteria is not met. Easy Time Tracking Software online for business with Worktime Tracking module underneath complex Employee Time Tracking Software Online. There are lots of business rules embedded in the tracking software to ensure user interface is simple and usable at all the levels. Employee Time Tracking Software helps you manage the timesheets for employees. There are separate authorisation configuration attributes which restricts what a manager can do? And what employee can do? Daily Employee Time Tracking is the right solution for employees, where they enter the data at the close of the day keeping the system up to date. Employee Time Tracking software at the end of a week or when the employee submits the time entries for approval it will accumulate all weekly and monthly hours and sent it to the line manager for approval. Once the time entries are approved then these entries are archived, persisted and made for a project, resource and payroll, cost and any business justification purposes. Employee Time Tracking Software provides individual employee daily record of their hours on day by day basis, time tracker facilitates it, let our Employee Time Tracking Software online help you making your business management skill more sharpened, more attentive, and more hassle-free! Cloud-bases technology available all the time. Timesheet has an easy interface for timesheet data entries, manually, by the attendance management system or heads. With Employee Time Tracker Software, you and your employees can enjoy the flexibility to enter hour and time from their Smartphones, Web-based portals, Wireless or network time clocks, Voice responsive systems, and Bio-metric fingerprint systems. Our employee Time Tracker Software provides automatic timesheet approval, All of our Online Employee Time Tracker software ensures you automatic and quick approval of timesheets when requested by your staffs, down before the payroll closes! Separate Portals for Employee & Administrators! There are different sections and portals for your employees and the admins so that uncomplicated clock in and out process can be ensured! Real-Time Status Updates! Our software system allows you to enjoy a real-time and synchronized status update on employees’ attendance; whenever you want! Simplified Features! Both you and your employees can enjoy multiple views of their timesheets on the basis of Daily, Weekly, Monthly, and Departmental Summary as well. Ease of Integration! One of the most impressive and cost-effective features of our Employee Time Tracker Software solutions is its simplicity to be integrated with your company’s existing systems including accounting software and vendor management system. Finally, our Employee Time Tracker software uses cloud-based technology to provide seamless functionalities. 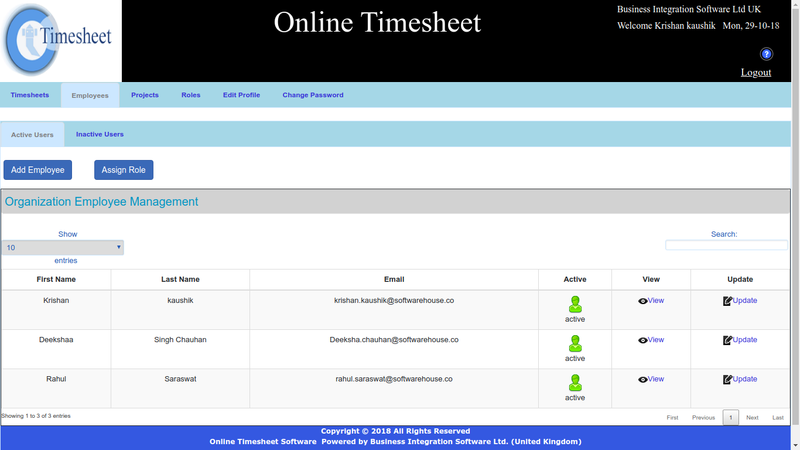 Multiple Employee Timesheet Software provides complete facility to maintains the user, here we can add a user, update user and deactivate any user, employee desk provides user-friendly panel we also can view the employee information, line manager etc. Multiple Employee Timesheet Software provides the details of submitted timesheet by employees, line manager maintains their team member timesheets. Multiple Employee Timesheet Software Online with each Employee Time Card Software embedded. Online Multiple Employee Timesheet Software provides full functionality of timesheet software capable of handling any number of employees seamlessly. Multiple Employee Time Tracking Software is synonymous to the timesheet software and provides similar functionality but the emphasis is more on tracking hours and validation. Multiple Employee Time Card Software provides time card facilities for persisting and retrieving daily and weekly time entries.